PuroBio "Impeccable" Vegan Mascara curves and reveals the full length of lashes! Its fortifying and restructuring properties in organic bamboo hydrosol protect and nourish your lashes. Its rich texture and intense black envelop lashes to give them a natural look. Thanks to its curved brush, its application is easy, even in the most difficult areas. Purobio Organic Lengthening Mascara defines lashes by curling and lengthening them! 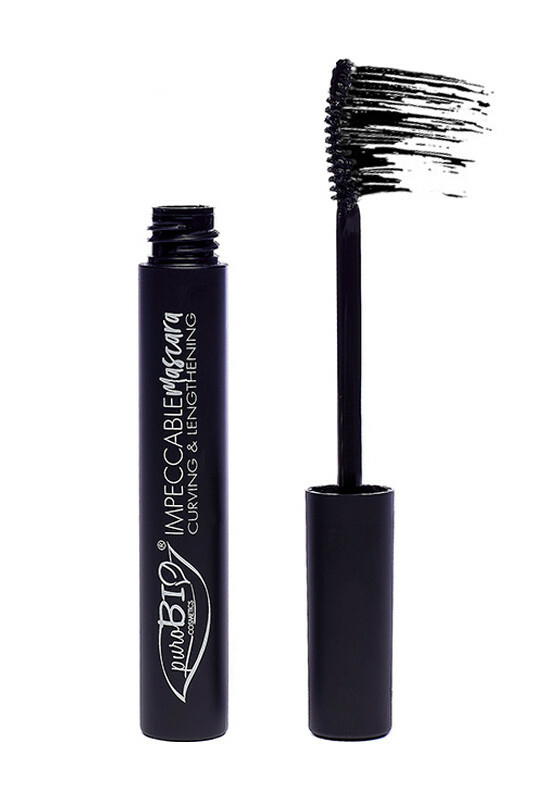 PUROBIO Lengthening & Curving Mascara lengthens the lashes! Place the brush at the base of the lashes, make a slight zig-zag movement from bottom to top. PUROBIO Organic Vegan Mascas take care of your lashes! INCI 01 Black : PHYLLOSTACHYS NIGRA EXTRACT*, SILICA, KAOLIN, ISOPROPYL MYRISTATE, PULLULAN, CETEARYL ALCOHOL, PERFUME, SUCROSE PALMITATE, GLYCERYL STEARATE, GLYCERYL ROSINATE, COPERNICIA CERIFERA CERA*, GALACTOARABINAN, AQUA, POTASSIUM PALMITOYL HYDROLYZED WHEAT PROTEIN, TOCOPHEROL, SORBITOL, SODIUM STEAROYL LACTYLATE, MICROCRYSTALLINE CELLULOSE, CELLULOSE GUM, ACACIA SENEGAL GUM, TREHALOSE, PROPANEDIOL, GLYCERIN, BETAINE, CELLULOSE, SACCHAROMYCES CEREVISIAE EXTRACT, XANTHAN GUM, CI 77820, RHAMNOSE, RHODIOLA ROSEA ROOT EXTRACT, GLUCOSE, GLUCURONIC ACID. MAY CONTAIN +/-: CI 77891 (TITANIUM DIOXIDE), CI 77491 (IRON OXIDES), CI 77492 (IRON OXIDES), CI 77499 (IRON OXIDES), CI 77007 (ULTRAMARINES). INCI 02 Blue : PHYLLOSTACHYS NIGRA EXTRACT*, SILICA, KAOLIN, ISOPROPYL MYRISTATE, PULLULAN, CETEARYL ALCOHOL, PERFUME, SUCROSE PALMITATE, GLYCERYL STEARATE, GLYCERYL ROSINATE, COPERNICIA CERIFERA CERA*, GALACTOARABINAN, AQUA, POTASSIUM PALMITOYL HYDROLYZED WHEAT PROTEIN, TOCOPHEROL, SORBITOL, SODIUM STEAROYL LACTYLATE, MICROCRYSTALLINE CELLULOSE, CELLULOSE GUM, ACACIA SENEGAL GUM, TREHALOSE, PROPANEDIOL, GLYCERIN, BETAINE, CELLULOSE, SACCHAROMYCES CEREVISIAE EXTRACT, XANTHAN GUM, CI 77820, RHAMNOSE, RHODIOLA ROSEA ROOT EXTRACT, GLUCOSE, GLUCURONIC ACID. MAY CONTAIN +/-: CI 77891 (TITANIUM DIOXIDE), CI 77491 (IRON OXIDES), CI 77492 (IRON OXIDES), CI 77499 (IRON OXIDES), CI 77007 (ULTRAMARINES).